The All Star break is over, and it was a pretty theatrical and annoying one at that. We are back in action tonight with one of the largest lineups of the season. Unfortunately no one will be wearing a cape. The million dollar question in the air is how will teams be affected by the break? Lucky for us we only choose one game to work with, so we only need to worry about this effect on a single game basis. The last fact we all encountered were the Red Wings crawling into a deep sleep just before the break. They were on the road but also on a nice winning streak. Logically it follows that teams will pick things up in top gear coming back with no long rest in the foreseeable future. This will help us make a choice tonight. We were successful with Toronto twice just before the break if memory serves you well and we entered the break with a loss from Calgary. Our current record is a single dab below .500, but our success on goal spreads combined with wins keeps us in the black. Let’s come back from this break with fury like tonight’s teams! Our game is the Toronto Maple Leafs visiting the Pittsburgh Penguins. 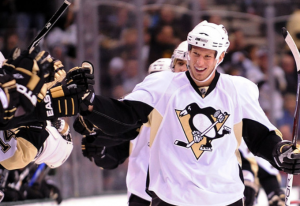 The Pens are on an enormous seven game win streak looking for the snowman. Toronto played well against the Islanders to our fortune before the break. They actually looked their strongest offensively in some time while staging the comeback in New York. But we will not stray from the idea that no team will come out sleeping tonight. Everyone will be playing at their absolute best. If there is any game Pittsburgh is likely to extend the streak even further it’s this one. Extra motivation is Detroit’s failure to extend their own streak. Pittsburgh will be able to learn from the Wing’s mistake and play with more fire. On top of this the Wings ended their streak on the road, while Pittsburgh is at home for this one. Pittsburgh is great venue to come home to on such a streak against a Canadian team. The biggest factor we have to count on is that the Pens will take this Toronto team seriously and be extra aggressive offensively. This shouldn’t be a problem as Toronto is also third in their division. The Pens are slightly closer to second (Philadelphia) than Toronto and have exacted 5 more total points through the season. Toronto is an even .500 on the road so again the Pens should be the more motivated team. Toronto’s two game winning streak, both against the Islanders, will not be a factor here and is as good as no streak.